Below is the image that was delivered to everyone who received an invitation to the event. 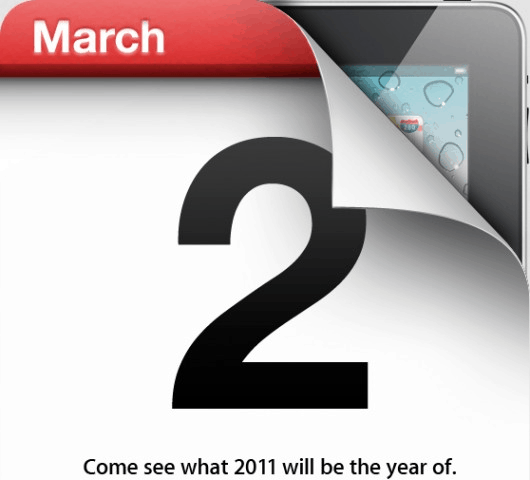 It depicts the giant March 2 date being peeled back to reveal the corner of an iPad. This doesn’t absolutely confirm that the iPad 2 will be announced, but we’re 99% sure that it will be. Additionally, according to a Foxconn leak via AppleInsider, they’ve already set into production for roughly 5 million iPad 2s. If you compare that to last years ~4 million, it sounds just about right. There hasn’t been any clues about the specs yet (other than faster, better, etc..), so we’ll have to sit on it until next week when Apple makes the official announcements.